"Anyone who loves chocolate and peanut butter together will want to make these easy treats!" In a medium bowl, mix together cake mix and butter. Set aside 1 1/2 cups of the mixture, and press remainder into the bottom of an ungreased 9x13 inch baking pan. In a medium bowl, stir together peanut butter and marshmallow creme; spread over the crust in the pan. Crumble remaining cake mix mixture over top. Bake 20 minutes in the preheated oven. Cool, and cut into squares to serve. This was good, but I'd recommend using a smaller pan, and increasing the peanut butter-marshmallow mixture. 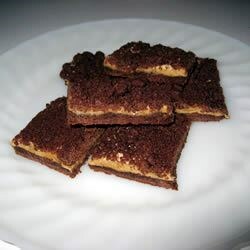 Great cookies, especially if you're a chocolate & peanut butter fan!! When I was assembling them, I didn't think it was going work, but they came out wonderfully. Yummy! Next time I'll put more crumbs on the bottom so the top part of the cookie isn't so thick.